SideStreamCleanPLUS is a packaged system using ILB, HTH, or a HTX separator and also including a pump, Solids Recovery Vessel, and other components assembled on a steel skid. 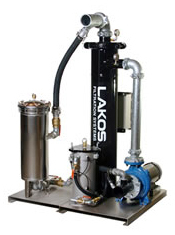 PLUS systems also include a Cleanable Cartridge Filter. If .35 micron filtration is not required, refer to the SideStreamClean. For full stream applications, refer to the TowerClean or TowerCleanPLUS systems. Separating solids out of Cooling Tower basins in side stream installations with additional filtration down to .35 microns in size. For applications where this additional filtration is not needed, refer to a SideStreamClean system.